Tripe refers to the edible part of a cow's stomach. It is available in select grocery stores and restaurants. If you are watching your weight, you may be wondering whether tripe is a good food for your diet. In most cases, you can fit tripe into your meal plan, especially when you keep in mind that no single food determines whether you gain or lose weight. You will gain weight if you have a positive energy balance, which means that you take in more calories than you expend. Fattening foods are those that may promote weight gain because they are high in calories and not very filling, so it is easy to eat too much of them. 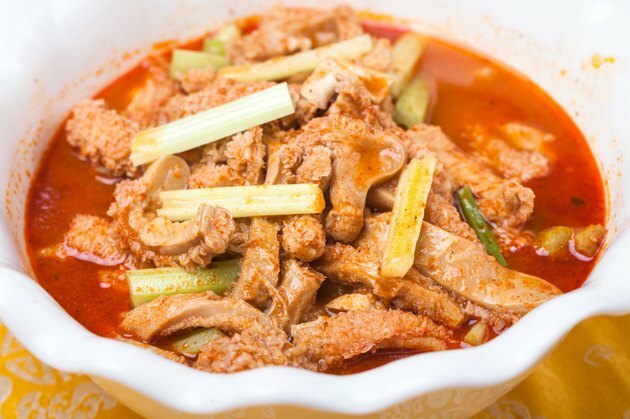 Tripe is a relatively low-calorie food source, with only 96 calories per 4-ounce serving, and it is less fattening than fatty meats, such as beef short ribs, with 283 calories per 4-ounce serving. Tripe can help you stick to a reduced-calorie diet, since each 4-ounce serving contains nearly 14 grams of protein. Protein is a filling nutrient because it slows down the emptying of food from your stomach after you eat, so that you may feel less hungry for the next meal. This may help explain why some high-protein diets appear to more effective for weight loss than low-protein diets, according to the Harvard School of Public Health. Consult your doctor for help designing a balanced diet for controlling your weight. Nutrient-dense foods can help you meet your nutrient needs while staying within your calorie limits to control your weight, according to the Dietary Guidelines for Americans 2010, published by the U.S. Department of Agriculture and the U.S. Department of Health and Human Services. Nutrient-dense foods are low in added sugars, unhealthy fats or sodium, and they include fruits, vegetables, whole grains, fat-free dairy products, and foods with lean protein, such as tripe. Each serving of tripe contains less than 2 grams of saturated fat. Tripe can be fattening if you cook it in fat or eat it with high-fat foods. Instead of frying your tripe, try lower-calorie cooking methods, which include roasting, boiling and poaching. Pickling is a common method of preparing tripe -- the vinegar adds only minimal calories. Menudo, or tripe soup, can be a filling, low-calorie meal, especially if the base is a clear broth and you add more bulk to your meal with vegetables.